The doors are wide open at Kuripuni Bookshop and the regulars walk in to find a gift that’s a bit different and have a chat with owner Anne Faulknor. But after 22 years in the shop, which provides a whole lot more than just books, she’s closing up and pondering the joys of semi-retirement. Faulknor’s been in retailing all her working life, and is an identity in Kuripuni Village. The bookshop is the last of the retailers left since the village was redeveloped. She’s very interesting to chat about retailing and its history of it in the town, but as she talks, she’s regularly interrupted by customers giving her hugs. “I’m old school. Look at my door it’s wide open,” she says. The shop is the ultimate small business – Faulknor runs the store herself and doesn’t go out for lunch. 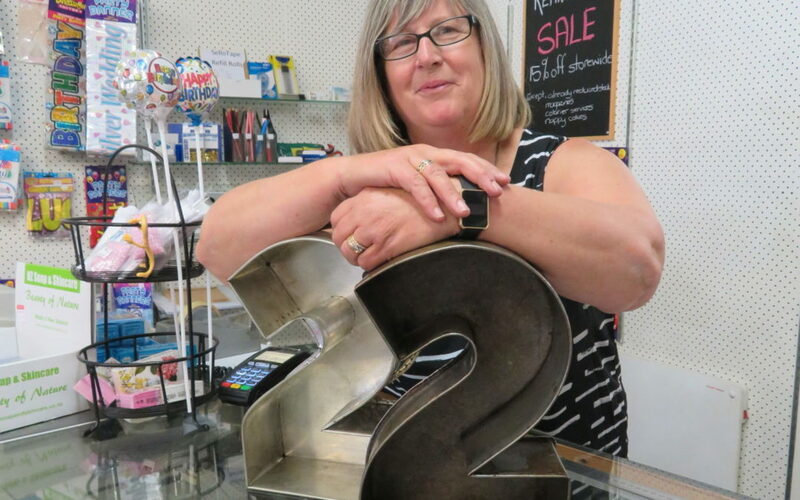 She’s had a bit of help on Saturdays and recalls as she chats with customers about how her children spent their time after school there and how her father helped out after he retired from Faulknors Service Station in Masterton. The bookshop sells cards and magazines, toys, and key-shaped mirrors for 21st birthdays, and there are “nappy cakes” for newborns. She stocks everything you need to decorate a cake and the icing sculptures and decorations are a wonderland. On a shelf on a wall behind her counter sit more than a hundred cake tins and cake molds available for hire. It’s been a big part of the small business and she wants to sell the tins all together, likely via TradeMe. The shop’s last day is November 30 and stock is on special in until then. A lovely shop. Very sad to see it go! I used to call regularly when I worked for the Book &Statiionery Wholesale company Hadley Francis Ltd. The shop was always had an interesting look. All the best for the future! Alpacas will miss you and so will we all. Oh noooo, what a pity someone else can’t run the shop. I just hope it’s not taken over by yet another eating place, we have to many of them already!